How often do you get to see a space shuttle so close that the wing is almost over your head? 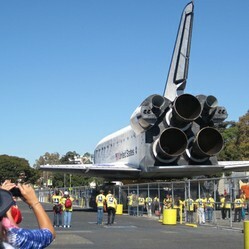 Here's my great photos of Endeavour arriving at the California Science Center. It takes something like a space shuttle trundling through downtown Los Angeles to tempt me to make the trip up to the big city. When I heard that Endeavour's progress through the city streets was being slowed down by tight squeezes, I hopped a train, navigated my way through the LA subway system, and arrived in the Vermont parking lot next to the California Science Center about 20 minutes before it arrived. Endeavour did not want to go easily into that good night. The baby of the shuttle fleet wanted to bask under a cloudless California sky for a few more hours. I spent about five hours in the hot sun keeping it company, but it was worth it! Without further ado, here's my pictures, photos, and one clumsy iPad drawing of Endeavour's last ride. A cheer goes up as the battle-scarred bird rolls past, practically glowing in the sun. The tail and engines of Endeavour dwarf bystanders and the L.A. Coliseum behind them. Someone kindly snaps my photo with the Endeavour. A streetcorner preacher with a megaphone instructs the space shuttle to repent. I confess that I like the red umbrella's message better. The patina of lift-off and reentry turns space shuttle engines and tiles into art. More abstract art: the seam of the cargo bay doors, with dark heat tiles shielding the hinges. I ogle the trailing edge of the wing flaps, which used to slow it from supersonic speed on reentry. Another space shuttle beauty shot with Los Angeles Coliseum at right. Junior astronaut: "Wheeeeeee I can fly!" Staring into sunglare, it often looked as if people were holding up Endeavour's wings with their hands. A worker minding rear clearance gives us a sense of scale. 2:23 PM. The Space Shuttle Endeavour finally comes to rest outside its new home, the Samuel Oschin Pavilion. Fooey, they skipped past me! Still fascinating. The Endeavour has landed in Los Angeles, and she's settling into her new home. Here's a sneak preview of the new California Science Center Endeavour exhibit! But Wait -- I Saved the Best For Last! However, photos or clumsy portraits of a space shuttle on the ground are nothing compared to the roar of the engines rippling across a beach on a chilly Florida morning. The first video below is an awesome compilation of all the audio and video feeds from a shuttle launch, everything from inside mission control and the shuttle to out on the beach where spectators watch. Click the video's title to open it in a spare window, choose HD and fullscreen (icon at lower right), crank up the volume (unless you'll wake the neighbors), and hold on tight. The second video is an excellent retrospective of the shuttle program, narrated by William Shatner, well worth watching in its entirety. The last is a lovely landing out at Edwards AFB, California. Fast forward to about 2:20 to hear the sonic booms and watch the vortices formed by the shuttle's wingtips. Remember, the shuttle lands as a glider, without using engines, so the pilot has one chance to get it right! A launch in all its rumbling glory, a great retrospective, and one perfect landing! Officially, its name is the Samuel Oschin Pavillion. It'll open to the public October 30. Here's ticketing information and much more. Space.com comes through with brief yet informative tidbits about Endeavour. NASA is really, really bad at tooting its own horn. The shuttle program assisted thousands of scientific and medical breakthroughs, but we almost never hear about them -- even though we all benefit from some of them. Here's just a few shuttle program "spinoffs." Not only was the Hubble's lens screwed up, but it would have fallen from the sky had not Endeavour and its crew done a space rescue at the very edge of the shuttle's range and human endurance (back-to-back spacewalks for DAYS) to repair a national treasure. Rewards? Decades of the most amazing telescope research and photos we've ever seen. A fascinating, fun documentary from NOVA chronicles one of the most daring shuttle missions ever. It was worse than you think! (Free on Amazon Instant Video if you've got Prime). What a gorgeous t-shirt design. Hey, Mom...? This space shuttle ornament always hangs proudly on our family's Christmas tree. Small lights glow behind the windows, engines, and on the wee satellite that an astronaut is assisting from the cargo bay. I've told the story of my own relationship to the space shuttle program already. How about you? What are some of your space shuttle memories? Have you seen any launches or landings? Do you know anyone who worked for the space program? Did you follow any of the missions or early launches on TV? Or are you lucky enough to remember some of the early space programs like Mercury and Apollo? Please, share some of your memories. Also, if you snapped any photos of Endeavour in Los Angeles that you'd like to show off, by all means, post a link to your photos in the guestbook below! I remember the shuttle traveling through town on it's way out to EAB when it was first built. When the shuttle landed out there, we would get two sonic booms so loud it rattled all the windows. Every time it happened I thought it was an earthquake. The big one! Great photos Ellen, it had to be an amazing day, sad in so many ways for you, the end of an era. I saw about 10 launches, only 1 from Titusville (12 miles away), the rest from Deerfield Beach (over 100 miles away). The Shuttle program has always fascinated me, and it's sad to see these technological wonders consigned to museums. Great pictures! It must have been very moving watching her go by. There is a lot of history there. Ellen, I am so glad you got to see the Space Shuttle up close and to photograph the journey to it's new resting place. A once in a lifetime experience, I suspect, and one you will never forget. Great photos! Unfortunately, I missed this homecoming, and the closest I ever got to a space shuttle was when I passed Edwards AFB (unknowingly) about 2 hours after a shuttle had landed there. But I vividly remember the horror of watching the Challenger disaster unfold on live TV. It was one of those moments in time that get etched in your memory in great detail. Awesome pictures of the space shuttle! I once watched a lift off from Cape Canaveral in Florida when I lived there. It's breathtaking. I don't know anyone connected with the space program and I am so excited for you that you got to be there when the shuttle landed. YOU are my closest personal connection with this bit of human history. Wonderful photologue. Earth once had a twin, and life on Earth might not exist without it. Learn why this long-lost "Planet X" is so important to us today. Lots of amateurs are attaching cameras (or even iPhones) to weather balloons and launching oddball objects into space to make amazing videos like these.